Home >> Generated from JAN's SOAR Information System on 4/26/2019 4:16:53 AM. 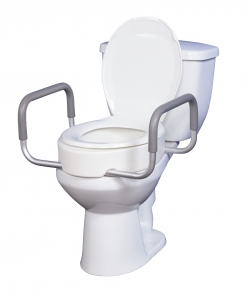 The Premium Seat Rizer with Removable Arms allows individuals to use their existing toilet seat and lid without any alteration. The Premium Seat Rizer easily attaches to the toilet and features tool-free removable arms, which offer flexibility to users. This toilet seat riser is made from a blow-molded construction which is not only durable but also attractive and natural looking. This bathroom product is backed by a limited lifetime warranty.